Description: This photo added 9/11/05...four years after the towers fell. Description: GE C40dash 8 part of Q247-15 power. Description: Dogged on the main waiting for broken rail to be replaced ahead. Description: Q632 eastbound at Fonda. Description: CP loaded potash train 638. Description: C40-8 # 7611 train 0805 runs light thru Mulberry to tie onto its train. Description: C40-8 # 7611 power for train 0805 runs light thru Mulberry. Description: C40-8 # 7611 with train 0805 returns to Mulberry Yard after a days work. Description: CSX 114 leads Q216 past the old C&O Station. Description: B798 heads north out of Massena with a recently repainted Dash 8 on the point. Description: Plenty of intermodal containers on this spring day. 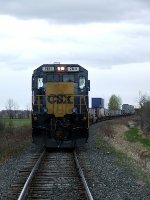 Title: CSX 7611 leads Q327 west approaching Breton Ave.